Originally published in 1949. 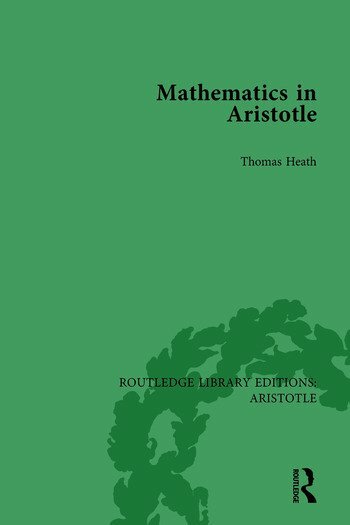 This meticulously researched book presents a comprehensive outline and discussion of Aristotle’s mathematics with the author's translations of the greek. To Aristotle, mathematics was one of the three theoretical sciences, the others being theology and the philosophy of nature (physics). Arranged thematically, this book considers his thinking in relation to the other sciences and looks into such specifics as squaring of the circle, syllogism, parallels, incommensurability of the diagonal, angles, universal proof, gnomons, infinity, agelessness of the universe, surface of water, meteorology, metaphysics and mechanics such as levers, rudders, wedges, wheels and inertia. The last few short chapters address ‘problems’ that Aristotle posed but couldn’t answer, related ethics issues and a summary of some short treatises that only briefly touch on mathematics.